So the wife and I are headed out to Papa’s Pumpkin Patch, and stopped for coffee on the way out. 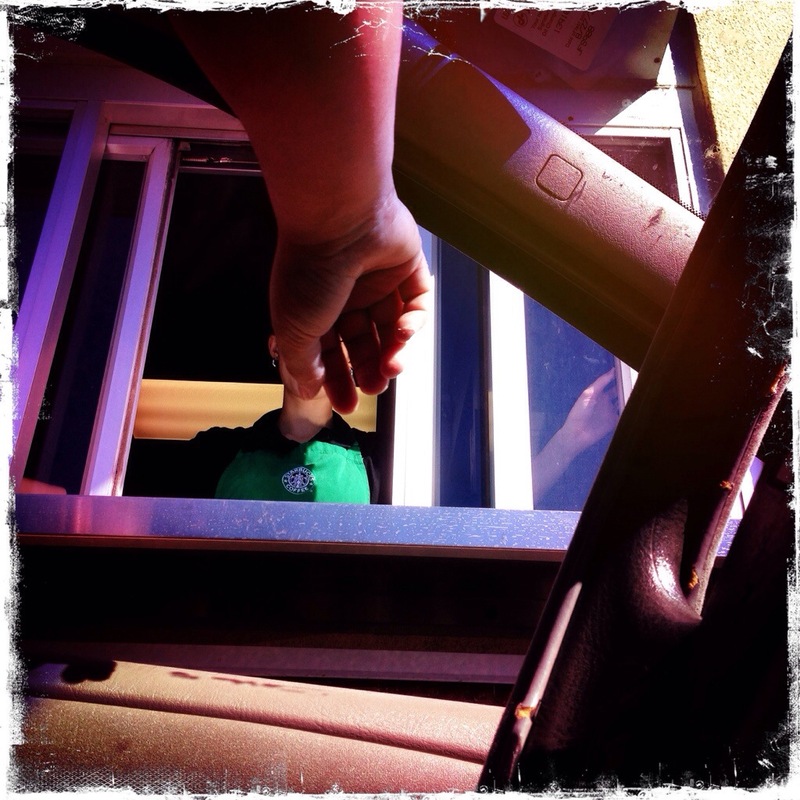 I thought I’d show the inside of a Starbucks from the inside of a car, and so I was hoping that they’d leave the window open so I wasn’t taking a candid photo of se barista and then posting it without their knowledge. Of course the only time the window was open was when she was in it, but how could I not snap the pic just in case? Luckily it worked out – the wife reached up for her drink and inadvertently blocked the barista’s face just in time so it’s game on! Changes inside my house. (You get to vote…) | Home’s Cool! Weekly Photo Challenge / B4 Retouch: Inside (Musée d’Orsay) | What’s (in) the picture? Inside My Cup – Weekly Photo Challeng | Linda Long Writes! Weekly Photo Challenge: Inside | Travel. Garden. Eat. Inside – WPhotoC | Ouch!! My back hurts!! Weekly Photo Challenge: (Intrusively) Inside | Free But Fun! Weekly Photo Challenge: Inside (A Train) | What’s (in) the picture? Weekly Photo Challenge: Inside | Okay, what if ? Weekly Photo Challenge: Inside | So where’s the snow? Weekly Photo Challenge: Inside (Maeslantkering) | What’s (in) the picture? Weekly Photo Challenge: Inside | What Is It?!? Weekly Photo Challenge: Inside | Steve Says…. Weekly Photo Challenge: Inside (A Train 2) | What’s (in) the picture? Peering Inside Windows | Not the Family Business! So this one is inside from inside! I love it. Great shot. Hey, that is terrific! A double insider. Nicely done. Thanks, I can’t believe I even thought of it! They have a drive through? You don’t have a Starbucks with a drive-thru? Nope. Not anywhere where I live or work. Dang. That’s ok though, it seems to me that when you’re in a rush it’s a lot faster to go inside. Love the angle …. brilliant work. *smile … even if I don’t like Starbucks *laughing. Ha ha, yeah I get that sometimes. This worked really well, Rob. Great angle.